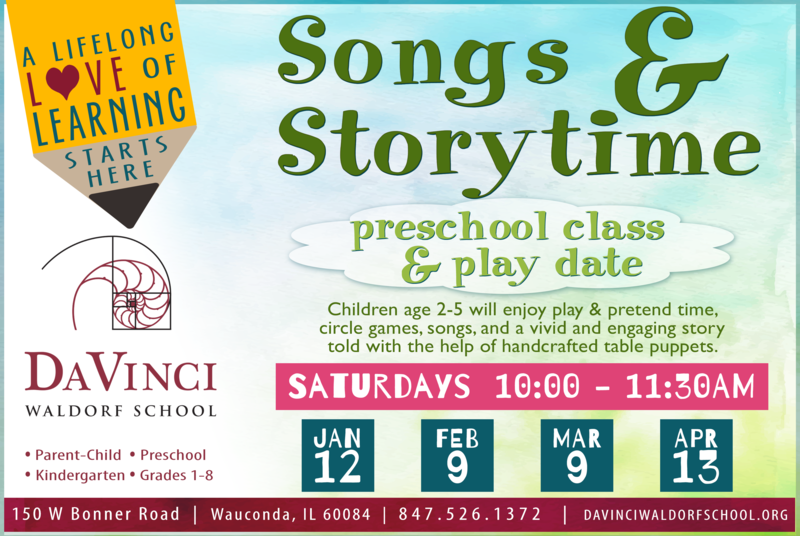 Bring a friend and join us for Songs & Storytime Sample Preschool Class & Play Date! Saturday, February 9th, 10:00-11:30 a.m.
Stop in for a fun Saturday morning play date and bring your friends to see for themselves what children experience in a Waldorf Early Childhood classroom! Children 2 to 5 years old (and their adults) are invited to Da Vinci Waldorf School to play, enjoy some circle games, and hear a vivid and engaging story. Parents experience the warmth and nurturing atmosphere of a Waldorf Early Childhood classroom first hand, meet other parents in the area, and learn more about our programs. Word of mouth is invaluable to our growth. Please consider visiting our Songs & Storytime Facebook event page and sharing it to your Facebook timeline or directly inviting those you feel might be interested. Share links to our Songs & Storytime RSVP Form. Every invitation, click, comment and share helps.